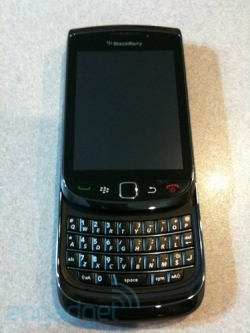 BlackBerry 9800 Slider headed for AT&T | BlackBerry Blast! "This particular phone is AT&T-branded, and it starts up with a carrier logo screen that proudly proclaims the 9800 a world phone -- sure enough, the About screen shows support for WCDMA bands I, II, V, and VI, which means you'll be able to use the phone for 3G service in Japan and most of Europe. " If you haven't had enough BlackBerry Slider pics yet, head on over to the source link below for engadget's pics.